Visual Solutions (M) Sdn Bhd already has a sizeable share of the local HR software market. Now, it is creating a global team and plans to set up an office in the US and have part of its software development team in China. Visual Solutions (M) Sdn Bhd may be one of the most significant companies you have never heard of. It has deliberately kept a low profile and spent next to nothing on marketing, choosing to grow organically through word-of-mouth recommendations. But the company has been around since 1991. It specialises in human resources (HR) software and has slowly built up an impressive client list. CEO CS Teoh may not be used to speaking to the media, but he is at his ease in this interview, set up by his venture capital investor, who thinks the company deserves a higher profile than it currently has in Malaysia. Astra Partners has a 40% stake in the company. Its chief operating officer Datuk Norazharuddin Abu Talib is very excited about its prospects and confounded by its continued low profile, considering its impressive list of clients and relative venerability in terms of the software industry in Malaysia. Visual Solutions already has a sizeable share of the local HR software market and has ventured into other parts of the region. Teoh says it measures itself against the likes of Oracle, SAP and Microsoft and has set its sights on the global market. It will be creating a global team and setting up an office in the US and having part of its software development team in China. Visual Solutions got its start when founder Yew Tek Hong, who has since left the company, decided to venture into software development. He had quit his job at Nemic-Lambda, a Johor Baru-based company that specialised in an advanced form of switching power supply, because he wanted to start a business in the IT field. It was still early days for the industry, but he was perspicacious enough to see which way the wind was blowing. When Yew started out, he did not know which field he would specialise in. The fact that it was HR-related software happened almost by accident. “Aiwa Electronics wanted a system to manage the clocking in and out of employees and the production workers’ shift assignments,” says Teoh. This was because calculating the payroll depended on things like overtime, which days you worked (there was a different rate for weekends) and whether the employees managed to have perfect attendance for the month, as Aiwa gave its employees a special allowance for this. It was with this small step that the company, known as Dynasys at the time, was born. “Initially, it was all about developing the software. So, from attendance, we went on to payroll and from there, to the employee database. Those were the early modules that kept the company going for the first four years,” says Teoh. At the time, there were only two employees and the company kept its overheads low. “You needed less than RM10,000 for the overheads. We had a very small office and in those days, the rents were way cheaper than today,” he says. By the second year, the company started to attract sufficient business to cover the overheads. And in 1995, Yew invited several friends to come in as investors. “That was when Visual Solutions was formed. Those were the years when it was all about the green screen text-based display. Windows had just come out and the visual impact of software was still a new thing. So, we said we were going to create solutions that were visual in nature and that was how the name came about,” says Teoh. The following year, it opened a branch in Taman Desa, Kuala Lumpur. And the year after that, in the heart of the Asian financial crisis, it opened another branch in Penang. “Our overheads went from RM10,000 to RM25,000. Our fees at the time were nothing to shout about. I would say our margin was between 12% and 15% in the early days,” says Teoh. Right up to 1996, the company only had five employees. “By this, you could see that growth was very slow. The headcount reflected the company’s size because it reflected its ability to support its manpower,” he says. At the time, the company’s projects were bringing in about RM10,000 to RM20,000 each. It got its first big break when tobacco company Rothmans decided to use its services. “The Rothmans deal was for RM58,000, which was a breakthrough for us. We tended to land deals through word of mouth. 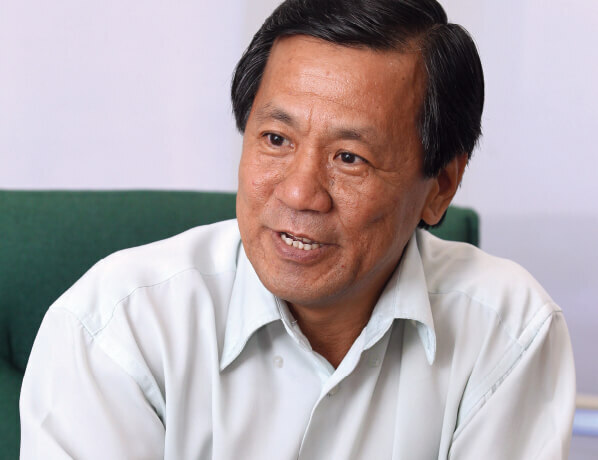 That has been the source of most of our growth until today,” says Teoh. Nevertheless, it continued to develop. Products were designed to suit companies’ requirements and some of them were remarkably complex. “Let’s say your staff works in shifts,” says Teoh. “If you have three shifts, that will be eight hours each. Confusion arises when you start your shift on Friday and finish it on Saturday afternoon. The first challenge in such a scenario is: Do you pay the Friday or Saturday rate? Visual Solutions built software to address this problem. “We built in heuristics, which is a very early form of artificial intelligence. What the software does is read your clock-in times and try to match them with the shift pattern that the company has put in place. Based on that match, it advises the manager that a particular employee is likely to be in the Friday shift,” he says. A product that Visual Solutions was the first to come out with is Business Alert. With this product, the HR department gets an alert on important days regarding a particular employee, such as his birthday, when his work permit will expire and when he is to be confirmed. “If you have a few hundred or a few thousand workers, it is very tedious to go through reams of data to figure out who are the people that have these needs. So, we developed a software that automates such tasks,” says Teoh. “We call it Business Alert and I think we were the first in the software industry — not just locally, but globally, to my knowledge — to come up with this. Because in those days, even the likes of SAP, Oracle or Microsoft did not offer this module in their software. These were some of the tools the company built into its FlexHR product. It also wanted to add a layer of intelligence so that the product could help HR managers make decisions. Sometimes, the customers themselves tell the company what their difficulties are, says Teoh. For example, there was an HR manager who managed the payroll of close to 1,000 staff and every month, she would receive queries from the staff about why their overtime was lower than expected or whether the tax deducted was correct. And each time, she would have to pull up the payroll file and calculate the figures manually to see if what they were paid was right or wrong. “That got us thinking. Since our system calculates the payroll, why don’t we lock down in a readable form, the list of statistics the system uses to calculate the payroll. For example, if your overtime was so much, how many hours were at the 1.5 rate and how many were at the 2.0 rate. So, it lists down the steps involved in calculating your salary. This makes the job of the payroll administrator easier whenever the staff needs clarification,” he says. The solution was quite simply called the “explanation feature” and it has proved to be one of the company’s most popular selling points. “So, in the FlexHR system, whenever the system is used to calculate some monetary amount, it will also provide you with an explanation of how it was calculated,” says Teoh. The company has extended this feature to more than payroll. “Your leave entitlement, for instance. Why do you have so many days for this type of leave? How many days will be carried forward and how many days will be forfeited? All of this will be locked down by the system. So, whenever you need to know why your days seem to be out, you can just click on that button and see the whole explanation,” he says. The explanation feature is a classic example of innovation driven by customer needs. Visual Solutions released this feature in 1998, but it was only in the past three to four years that its competitors have introduced a similar feature in their products. Visual Solutions has a module called Biz Analytics that looks at this. “One of the many features it has is the ability to show you where each employee by job grade is compared with the industry’s Compa-Ratio. This helps when at the end of the year, you want to give increments or promotions,” he says. There is another feature tied to talent retention. “We have a feature we call predictive turnover analysis. Each company is different in terms of the nature of its business, industry and how it operates, so there are many variables and each tends to affect staff turnover,” says Teoh. When someone is a flight risk, the company has the option of instituting “turnaround action”, such as more mentoring or more exposure to knowledge and skills. But if they are underperforming, why not just let them go? “You try to get them to improve their performance because if you lose this guy and get a new guy, the new guy is a blank sheet of paper who has to learn everything from scratch. So, even though this guy is underperforming, he still has some degree of value to the company,” says Teoh. Visual Solutions has also managed to win business from companies that previously used a foreign product. “Al Rajhi Bank, for instance, was using a foreign product for performance management. The bank used it for the first three years and then wanted to improve on its performance management practice and the product could not meet its needs. So, it switched to our software,” says Teoh. “Another affirmation that we had strength in performance management was when we competed for a project for Institut Jantung Negara (IJN). It started the whole performance management initiative by engaging KPMG to help it identify the areas it needed to focus on and how to go about measuring performance in those areas. He is quick to dismiss the notion that this was because Visual Solutions provided the cheaper alternative. “We were not cheaper. In fact, we had to drop our price to match SAS’ price. IJN selected us because we are a HR vendor,” he says. The company started in Johor Baru with RM50,000. Today, its paid-up capital is RM1 million and its annual revenue is almost RM11 million. It has more than 1,000 clients, including the entire Berjaya Corp group of companies, Tesco, McDonald’s, Texchem Group, Allianz Insurance, OCBC Bank, Agro Bank, Lonpac Insurance, the Tan Chong Group, Osram, Malaysian Mosaics, Mitsubishi Manufacturing and three of the four Panasonic companies. Although the company is one of the leading HR software companies in Malaysia, it still faces discrimination for being a local company. “We are thinking of rebranding our development and moving our design office to the US. But our development work will be more spread out. Today, it is all in Malaysia, but we plan to have it dispersed throughout the world. China is one of the potential candidates to have a development team,” says Teoh.